Crook Raju rather than Ramalinga Raju sounds like a better name for the guy who was responsible for wiping out Rs 10,000 crore in market capitalization on the stock exchange today. Now, this fella is a real WMD (Weapon of Mass Destruction). Just imagine how much havoc and uncertainty he’s created in employees’ and investors’ lives around the world. Like all notorious crooks, Satyam co-founder and Chairman B.Ramalinga Raju is not an interesting bloke when you meet him in person. a simple, yet extensive management model to create value, which promotes entrepreneurship, a focus on the customer, and the constant pursuit of excellence. Raju is passionate about developing leaders within his organizations and has conceptualized / institutionalized the Full Life Cycle Leadership (FLCL) model, a unique entrepreneurship framework that develops leaders at all levels of Satyam. A world-renowned visionary, global business leader, and thinker….constant pursuit of excellence? Is there no limit to baloney. Who wrote this nonsense on the Satyam web site, we want to know. Hang the sycophantic idiot. Now this Crook Raju has set a unique and dubious record in the annals of Indian business – by day’s end in India he had managed by his fraud confession letter the amazing feat of burning the market capitalisation of Rs 12,067.98 crore on Tuesday to Rs 2,691.88 crore on Wednesday. deep regret, and tremendous burden that I am carrying on my conscience. What does the word mean and how do you spell it – C R O O K. Right? It was like riding a tiger, not knowing how to get off without being eaten. Well, Ramalinga Raju you are soon going to be eaten alive by bigger tigers inside India’s notorious jails. 3 Responses to "Crook Raju Wipes Out Rs 10,000 Crore in Market Cap"
calm down. what’s with all the Satyam posts? 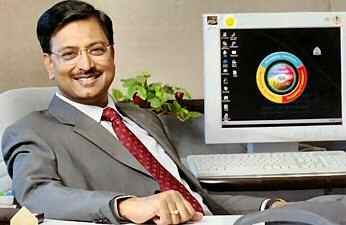 You write above: what’s with all the Satyam posts? Most likely the biggest corporate fraud in Asia. We haven’t heard the last of Satyamgate yet. Yes shadowfox, this is heart breaking for every Indian techie. Indian software industry considered to be a clean body the world can trust and do business so far. The country’s economy over the past decade gallopped because of this trust and committment. Now, beacuase of this SOB Raju the international community would fear doing business with entire India Inc. Big time blow for India Inc. I got reminded by milks scams used to happen in our neighbourhoods when I was a kid. A pouch of milk is given to you a ruppee lesser if you prepay for entire month. There would be an agent who collects the money and distributes milk. This agent gains the trust of the people and more and more joins him, and one fine day when every one joins in the eve of 1 day of the month i.e. after getting all the monthily prepayment, he vanishes. Ah, this would now repeat with a new agent again. Finally after seeing 5-6 guys doing the same, people decided to stop prepaying for milk. The SOB Raju story is similar to this, he waited for big money and growth to accumulate, kept the board unaware on tweaking the books, and one fine day he planned to move all the looted money to a safer place, and got caught. The news channels are flashing like, 7 years jail etc… but so far no one is ready to give a complaint on this scam, the political leaders from AP has already publicly supported Raju. He will go untouched. All these rich bast***ds always managed to get away with all the scams, affected are the middle class retail investors (like me, lost as much as 78k in the market due this). You write above: the political leaders from AP has already publicly supported Raju. He will go untouched. Most likely, Ramalinga Raju will go to prison for at least a few years.